Board certification and recertification exams are critical career moments. 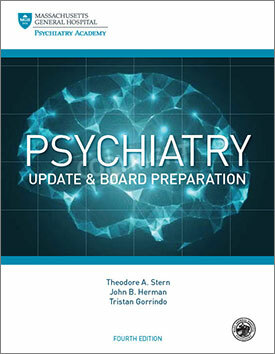 That is why you should rely on the Massachusetts General Hospital Psychiatry Update & Board Preparation, Fourth Edition. It puts our 80+ years of clinical experience at your fingertips to help you prepare for your exam. This powerful and in-depth study tool contains 88+ chapters on all the key topics in your psychiatry exam. In fact, it is designed specifically to meet the requirements of the National Board of Medical Examiners and the American Board of Psychiatry and Neurology (ABPN). Senior faculty in the Massachusetts General Hospital Department of Psychiatry developed every chapter. Eating disorders, behavioral interventions, child psychiatry, dementia, emergency psychiatry, geriatric psychiatry, neuropsychiatric conditions, psychopharmacology, seizures, sleep disturbances, substance use disorders, suicide, and much, much more. This Fourth Edition is fully updated for new standards and criteria in the DSM-5. If you are not taking an exam this year, use this tool to refresh your clinical knowledge and skills. Our study guides have helped residents and psychiatrists prepare for exams for decades. Here are a few online reviews about the Third Edition. You can find the same level of excellence in this Fourth Edition! U.S. News & World Report ranks the Massachusetts General Hospital Department of Psychiatry among the best in the nation each year. We are proud to put all of our clinical expertise into this complete overview on the field of psychiatry.